Do you recall the days when you needed to call up a stockbroker in order to make a stock trade? And you needed to make the trade in a “round lot” (you had to buy 100 shares)? Did I just date myself? Thanks to the internet that’s no longer the case and it’s easy for anyone to invest in stocks with an online brokerage (like, you can do it on your smartphone easy). And not only is it easy but it won’t cost you an arm and a leg to get started. “So which account do I open,” you ask? There are a number of places to go these days thanks to the rise of online trading and brokerages. I want to make sure you find one that works well for you. I’m going to tell you about some great brokerages but I want you to first understand what you should look for before you open up an online brokerage account. How important investment choice is to you will depend on what you intend to do with the account. For the most part, you’ll want a brokerage account that has the widest investment choices available. That will include stocks – both foreign and domestic – mutual funds, ETF’s, options, REITs, bonds and other debt securities, and even commodities. You’ll also want the investment choices within each asset class to also be as wide as possible. But if you plan to maintain the account for a very specific purpose, you may be more interested in a specialized account. For example, if you plan to trade options as your primary activity, you’ll be more concerned with the choices and the execution capabilities of the broker over the sheer number of asset classes it offers. You’ll also be interested in the amount of financial information provided, especially free information. As an investor, you need information and you need it as quickly as you can get it. You’ll not only want streaming stock price updates, but also the latest news, research, and technical analysis to help you in your investment decisions. As an investor, you’ll want to be able to move your money from one account to another quickly, easily, and at the lowest cost. The best way to do this is generally through linking your brokerage account to your checking account, savings account, and even loan accounts if you also want to pay bills through the account. A brokerage account should make this process as easy and as inexpensive as possible. There are brokerage accounts now that even have check-writing options off of money-market accounts. And many brokerages are owned by banks making transferring money between accounts smoother. You need to consider if having your banking in the same place as your investments work for you (some people don’t like having all of their accounts in the same place). Obviously, you will want to take a close look at transaction fees. This is especially important if you are a frequent trader. If, for example, you make 100 trades per year, the difference between a firm that charges $7.95 per trade versus one that only charges $5.95 per trade can be substantial. That difference will result in $200 in extra transaction fees per year. Still, you’ll have to match this against other fees charged by both brokers to determine which is the better deal. Some firms charge an annual fee – under various titles – and others charge no annual fee at all. For the example above, you’ll find you’re actually better off paying $7.95 per trade if that broker has no annual fee, as compared to the one that charges $5.95 per trade but also has a $300 annual fee. Also, take a look at any purchase minimums the broker may have. You may find that commission fees are low, maybe even non-existent, but you have to buy a minimum amount first. There are other charges to consider as well. Some firms may have inactivity fees, low balance fees, and charges for banking services that you use frequently (or infrequently even). Low balance fees can be particularly significant. If your account will have a relatively low balance, say less than $10,000, the fees will generally be higher as a result. In this case, you will have to look for a broker that specifically markets to small investors through low or nonexistent fees for small balances. You may find that these soft costs outweigh the benefits of going with one that charges the lowest transaction fees. Since most brokerage accounts are handled online today, convenience is mostly about ease-of-use on the site. Some sites are better than others, but this is also a factor that can change over time. Some sites can improve after a rough start, others can show signs of decline, perhaps due to the addition of incompatible applications. Depending on your preferences, you may also want a broker with physical locations in your area. For some investors, this can even outweigh the efficiency of the website. At a minimum, it gives you the ability to speak with a live person face-to-face if you need a problem resolved. Sooner or later you’ll either a) want to do something is out of the ordinary, or b) have a problem that you cannot resolve on the broker’s website. When that happens you will need to get assistance from real people. How well the broker handles the exchange can be a major factor in determining whether to go with one broker as opposed to another. Even if you are working with a broker that has such an efficient website that nothing bad happens 99.99% of the time, there will be that event – once or twice each year – that will define your entire experience with the company. If they are able to resolve the problem to your satisfaction, you’ll be a customer for life – or at least until the next problem pops up. If not, you may decide that low fees or not, you’re going to take your business elsewhere. There are two major sides to the customer service experience. The first is your ability to get a hold of someone in a reasonable amount of time. The last thing any of us ever want when we’re trying to fix a situation gone bad is to be routed through a voicemail maze or to be kicked out somewhere along the process. The second is the ability of the representative to solve your problem. In some companies, customer service people are empowered to fix problems. In others, they are tied into a bureaucratic maze that makes solutions hard to come by, and slow in coming when they do. No amount of low fees will overcome the inability of a broker to fix a problem that will cost you a bunch of money if they can’t. Has the brokerage been in the news lately? Why? What are customers and the press saying about the brokerage? Before you pull the trigger on a brokerage check to see its reputation. I want to know if there have been any major fines or scandals that the brokerage was involved in. Also, check to see what users are saying about the brokerage. You want to know why people may be unhappy. Don’t take opening a brokerage account lightly. As simple as it is these days to open one up and start investing you still need to do your homework first to make sure the brokerage fits your needs. So what are some great online discount brokerages that are inexpensive? With Trade King you are getting an online broker with $4.95 for stock trades, and this includes broker-assisted trades. They were rated #1 in customer service in 2010-2012 by SmartMoney magazine while Barron’s gave TradeKing four stars five years in a row. They offer a full suite of trading and research tools for you to use. You can also connect to their Trader Network where you can see what other traders are doing and why. There are no surprise fees or account minimums to worry about. When you refer a friend you both earn $50. Also, transfer your brokerage account to TradeKing from another brokerage and they will cover transfer fees up to $150. See our review of TradeKing. Visit TradeKing for more information and to sign up. Betterment is a unique online discount brokerage. See, you can really only invest in two funds – Stocks or Treasury Bonds, each made up with a basket of various ETF funds. Betterment is for the beginning investor that wants to invest in the market without having to figure out where to start. That’s why there are only two choices. On top of the ease of choice, Betterment doesn’t have commission fees when you buy or sell. Instead, you are charged an annual fee of up to 0.9% on your account balance. If you decide to add to your account every week you won’t be paying a commission each time (the same is true if you decide to take money out). Your account is linked to a checking account to make adding money easy. This is great for those who want to grow a portfolio little by little. Betterment will also automatically rebalance your portfolio and re-invest any dividends your funds earn. This way your portfolio maintains the allocation of stocks and bonds you choose. There are no minimum, transaction, or hidden fees. Betterment is an easy way for an investor to put money into thousands of companies at once. See our Betterment review for more details. Betterment is running a promotion for a $25 bonus if you open up an account with at least $250. Visit Betterment for more information and to sign up. TD Ameritrade offers up a flat-fee commission of $6.95 on many of their online trades. You can trade stocks, ETF’s, mutual funds, options, Forex, and more. They have been in business for over 35 years. You have a number of tools at your disposal including their Trade Architect™, thinkorswim platform, and QuoteScope™. They offer over 100 commission-free ETF’s to choose from. There is also a robust knowledge center available to help you become a better investor. TD Ameritrade had a current promotion where you can trade commission free for up to 60 days as well as get up to $600. See our TD Ameritrade review for more. Visit TD Ameritrade for more information and to sign up. E*Trade may be one of the best known online discount brokers in this list, what with their memorable Superbowl commercials and all. Cute commercials aren’t all you get though, you also get a well-respected and highly rated brokerage. Stock trades are $9.99 or less (higher balances can net you a lower commission structure). Managing your money is made more efficient with access to E*Trade bank (checking and saving). You have access to free investing education tools including 3-minute educational videos, live and on-demand web seminars, and more. Account holders also have access to independent research from the likes of Reuters, S&P, and Morningstar. Use E*Trade’s mobile for research and trading on-the-go. There are no account services fees. E*Trade has a promotion going where you can get free trading for the first 60 of opening your account (you must the account with at least $2,000). Visit E*Trade for more information and to sign up. Loyal3 is another brokerage that’s a little different from the others out there. They offer up fee-free trading. The catch is you are limited to a small number of individual stocks and IPO’s. There is no fee to transfer your funds to another brokerage if you find you aren’t happy with them. Loyal3 uses batch trading to save on trading costs. They batch together all of their orders at one time when they process their transactions. In this way, they pass on the fee savings to you by offering free trades. They are limited in the stocks you can buy but they can be an interesting option if you are starting out and you’re interested in the stocks they offer. See our review of Loyal3. Visit Loyal3 for more information and to sign up. Motif Investing is an interesting addition to the online brokerage scene. With these guys, you can put together your own basket of stocks to invest it (you create your own ‘motif’). It’s like being able to create your own ETF. There are also a number of Motif’s that have already been created that you can choose from. So instead of having to go through individual trades for each company you might want, you only pay one fee of $9.95 for your Motif and that covers all of the stocks in your Motif basket (you can pick up to 30 stocks). They differ from ETFs in that you can hand-pick the stocks you are grouping together. As a result you aren’t paying the expense ratio fees you would with an ETF. See our Motif Investing review for more information. Visit Motif Investing for more information and to sign up. Personal Capital gets a special mention here. They offer up a wealth management service that has reasonably low fees for access to a live human to help you with your investments. That part is pretty cool. But they also have a free service that’s super! You can use Personal Capital to track all of your investments in one place. You can have it set up so that you’ll see the investments from various brokerages all in one convenient place. This is such an important tool since it allows you to see everything you’re invested in and you can tell what your allocations are in one spot. The tracking portion is free. Take a look at our review of Personal Capital. 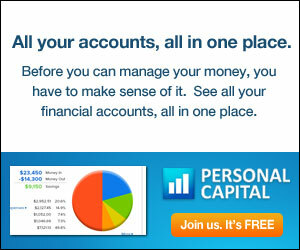 Visit Personal Capital for more information and to sign up. As you can see, it shouldn’t cost you an arm and a leg to start trading. There are clearly a number of great companies to choose from to get you on your way to investing. These are some of the best online discount brokerages for cheap trades that I know of. If you have a favorite that isn’t listed let me know. Which is your favorite online discount brokerage for cheap trades? Take a look at some of the best places for you to invest online that won't break your bank, especially for the beginning investor. Also see what to look for in the best accounts. Nice article on inexpensive brokers. I also remember the days of having to trade round lots and used a paid broker to even put money into a mutual fund. These days, I do everything online, but am only interested in low-cost passive index funds. I don’t really trade them. I buy and hold. I keep my desired asset allocation correct by purchasing new shares of the under-weighted asset. There are typically no costs to trade mutual fund shares or even ETFs as long as they are in family with the brokerage firm’s funds. Actually, I kinda miss calling up my broker. I don’t miss the prices, but I do miss the interpersonal relationship with my broker. Oh yeah – also you forgot schwab on this list. They aren’t necessarily a “discount” broker, but they are for sure a lot cheaper than some others. Great list of brokers with a lot of perks to take into consideration with each of them. For people new to the trading world the inclusion of tools and videos I think is incredibly beneficial. Trading blind is asking for financial failure. I do like the flexibility that comes with being able to handle trading online. Investors have so much more educational material available to them now than a decade or two ago. Great post as I’m currently looking for a good broker to do some dividend growth investing. I’m feeling partial to Sharebuilder since i have checking and savings with them as well. Hey Syed – I like Loyal3 – they have a pretty good zero fee based model. You can’t say no that . yeah thats true discount brokers offers trades at low prices but dont you think full service brokers provide good support over discount brokers?